I wanted to drop you a line regarding our second ABR Boxer, Gastro, formerly Mario, who we fostered as a puppy, and failed miserably at it. 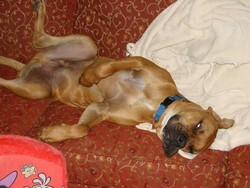 As you can see from our photo, he has become very comfortable in our home, and isn’t shy about occupying the couch. He has been such a blessing to our daughter, who is only a year older than he is, and he’s endured her well. Thankfully, Gastro, at 85 pounds, is petrified of our 14-pound, 15-year-old cat, and has smartly chosen to allow her to be the Alpha in our home! He gets along well with our miniature pinscher, Frenzy, and tries not to playfully chew on her too much. I am so glad that I found ABR. Both of our ABR dogs have given us so much joy. Thank you for all you do. Joe, Lyn, Vivien, Gastro, Frenzy, and (reluctantly) Kitty.